You may have never wondered what’s in the DNA of a football fan, but the Baltimore Ravens planned to find out. 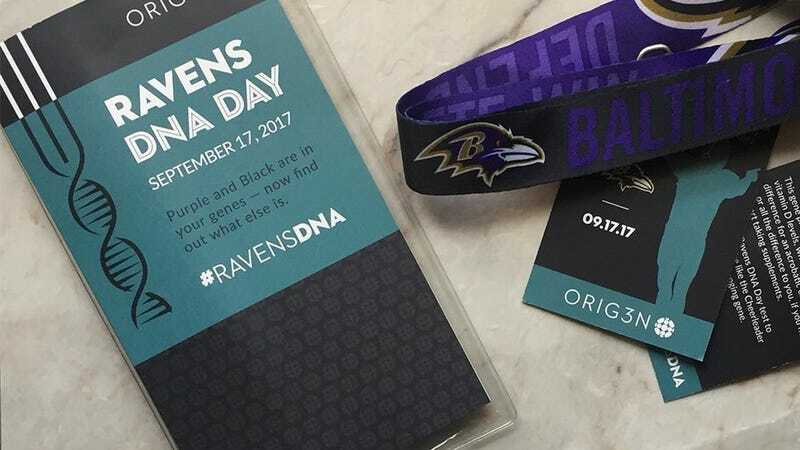 As part of a bizarre game-day promotion on Sunday, the Ravens partnered with consumer genetic testing company Orig3n to give away free DNA test kits to 55,000 fans as they entered the stadium. But the plan was hastily abandoned just a few hours before kick off, amid concerns about privacy and an inquiry from the federal government about whether the company’s labs lacked necessary certifications. The promotion, though, quickly attracted attention from those wary of the ways in which a mass collection of DNA data could become a mass violation of consumer privacy, collecting and storing valuable genetic information from thousands of fans. What may wind up a relatively minor regulatory snafu found its way into stories in the Washington Post, ESPN and the Baltimore Sun, among other outlets. Why all the hullaballoo? Those headlines might be read as an indication of the growing suspicion many have of consumer DNA testing, and the ways in which the information from those tests can be used. Regulators, for one, are certainly looking with more scrutiny at consumer tests. The question of whether Orig3n needs a CLIA certificate comes at a time when the FDA has signaled it plans to more strictly oversee health-related consumer DNA tests, which are exploding in popularity. In the meantime, we may still find out what’s in a football fan’s genes: The Ravens say the Orig3n DNA Day giveaway will eventually be rescheduled for another date.